In the three weeks between deciding to go to Morocco with my friend Tracy and actually boarding the plane my daydreams certainly soared. AFRICA! ran on repeat in my mind. 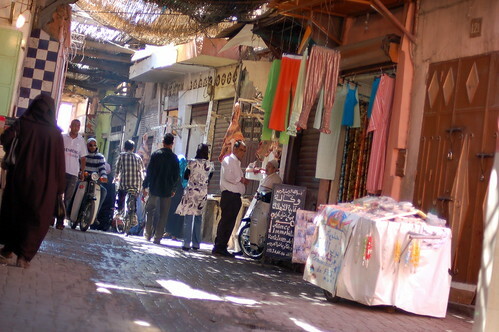 I imagined and read about and looked up photos of the exotic allure of Morocco. I checked out CDs of Moroccan music from the library and read Paul Bowles. After all that buildup it wouldn’t have surprised me to be disappointed upon arrival, a bit like the letdown when you finally see Stonehenge – it is what it is. But from the moment I stepped off the plane under the pounding sun the thrill never left. Paul Bowles says “If people and their manner of living were alike everywhere, there would not be much point in moving from one place to another.” I had thought Europe was different from home. Morocco was an entirely new world. It’s an assault on all my senses and a test of my reflexes. The scent of mint and cumin compete with diesel fumes. Scooters bearing families of four buzz by within millimeters of my elbow – I leap out of the way, careful not to trip on the uneven cobblestone or step in front of that horse or donkey whose clip-clopping hooves can’t be heard in the hubbub. The call to prayer tries to rise above the melee of the souk proprietors calling me to their store, the trill of the snake charmers and the little boys asking where I’m going so they can lead me there for a few dirhams. Behind it all is often a throbbing drum. And constantly my eyes try to take everything in. How many places can I look at once? I’m drawn to the intricately ornate doors, the pattern of the archways, the gleaming treasure heaped at every step. Most of all I look up – up to the sun filtering through the reeds that provide blessed shade, and to the thousand and one lanterns that I so want to take home. I wonder aloud to Tracy how long before the sights and sounds and smells are just part of your life, and not something to stop and take in. I can’t stop exclaiming (to myself and out loud) about every single thing I see, smell, hear and taste. 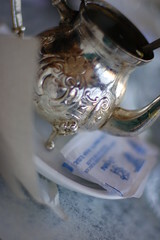 And just when I’m lulled into complacency as I sip a refreshing and sweet mint tea I remember – I’m in AFRICA. Morocco is not just as advertised – it’s over the top more. 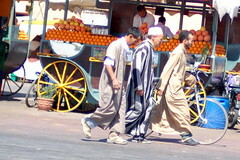 The men in striped djellabas walk hand in hand, the veiled women speed by on scooters, the sea of human and animal traffic never stops. 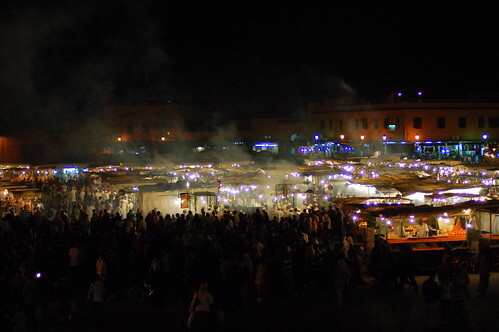 We return again and again to the pulsing heart of Marrakech, Djemaa el Fna. By day the square opens up to the sun-washed blue sky stretched tightly over us. As the sun sinks to the echo of the muezzin from a dozen mosques the already vibrant square leaps to frenzied life. Henna tattoo artists and brightly-clad clinking water sellers give way to night. The cacophony that would overwhelm me elsewhere energizes me here. Smoke pours into the gold and rose tinted sky from the sizzling food stalls. Orange juice vendors call to us, groups of musicians scattered here and there compete with one another for paying onlookers, and we push our way through the throngs. I returned home Friday night and yesterday Brian smiled happily as we sat together in the living room so far from my adventures, and said “It’s like you never left.” But even though my henna tattoo is fading, my blisters are healing and my sunburned skin is back to normal, it’s not like I never left. I had only daydreams of Morocco before I left. Now I need only bury my face in a bouquet of mint or taste a cumin-infused dish and my daydreams meet my memories.